A few months ago, I made a batch of homemade soap for kids with hidden toys, and I got excited thinking of different ways to create unique soaps. One idea my mom shared with me were homemade soap loofahs. Homemade soap loofahs uses loofahs as a mold to hold soap. The result is a wonderfully fragrant homemade soap with exfoliating properties — so you can wash and exfoliate at the same time. I think it’s pretty brilliant! 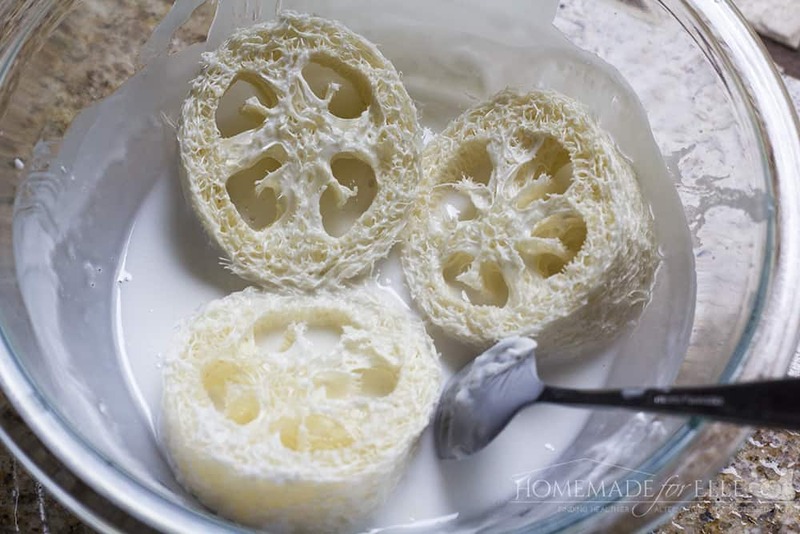 The first step in creating homemade soap loofah is to find a durable loofah. These are available at most Walmarts, Targets and even dollar stores, or you can pick it up online at Amazon. 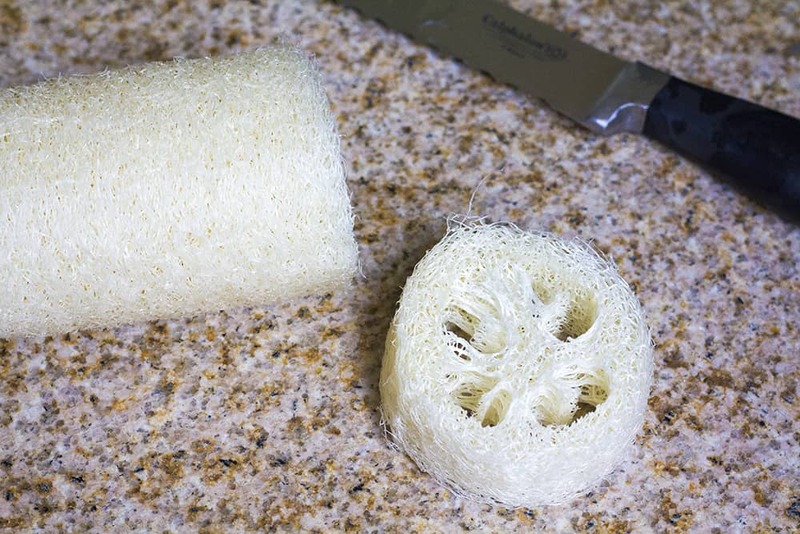 To make: Cut the loofah into 1″ pieces. A serrated knife makes easy work of this task. Next, you melt 1 pound of soap base in the microwave, stirring every 30 seconds. 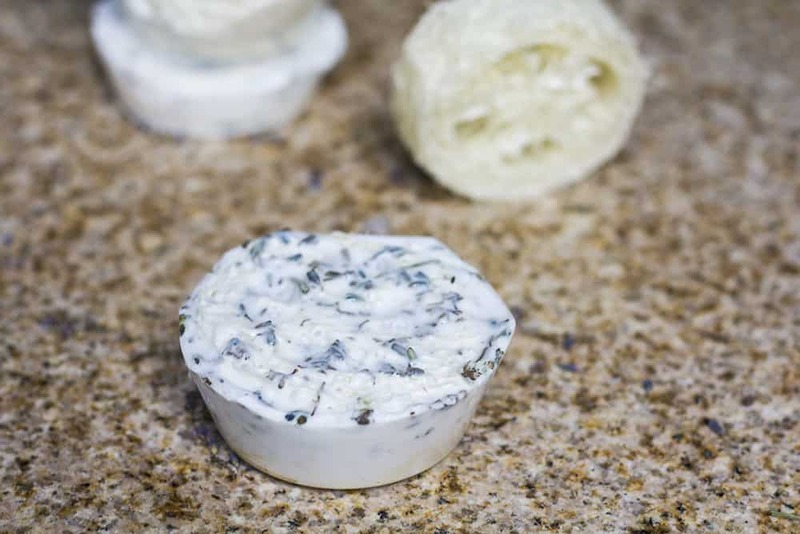 Once melted, lavender and chamomile essential oils are added, and the loofah pieces each get to soak in the soap mixture for 1 minute. Then lavender buds are stirred into the remaining soap mixture. 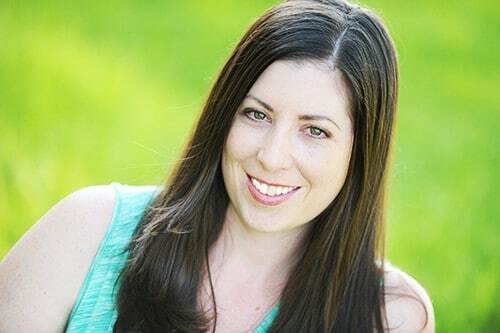 These are optional, but they’re a great option that I highly recommend! Next, you pour the soap mixture over the loofahs, covering just above the top of the loofah. 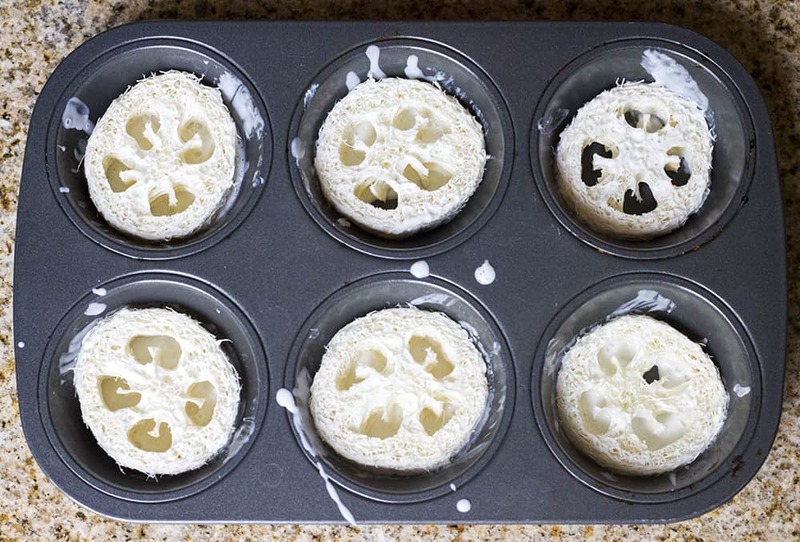 Let your loofahs sit in the muffin pan for about 4 hours. Run a knife around the rim, and remove. Then they’re ready to use! Or to give to friends, family, or coworkers as gifts! Luckily, no one tried to grab it and eat it — BUT — you’ve been warned that these look good enough to eat! Melt soap in the microwave, stirring every 30 seconds. 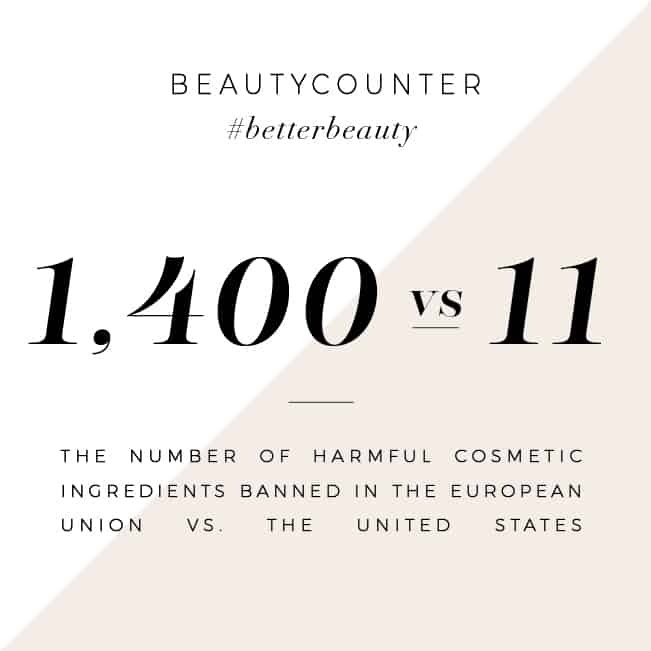 Stir in lavender and chamomile essential oil. Place loofahs into soap mix, and let sit 1 minute. 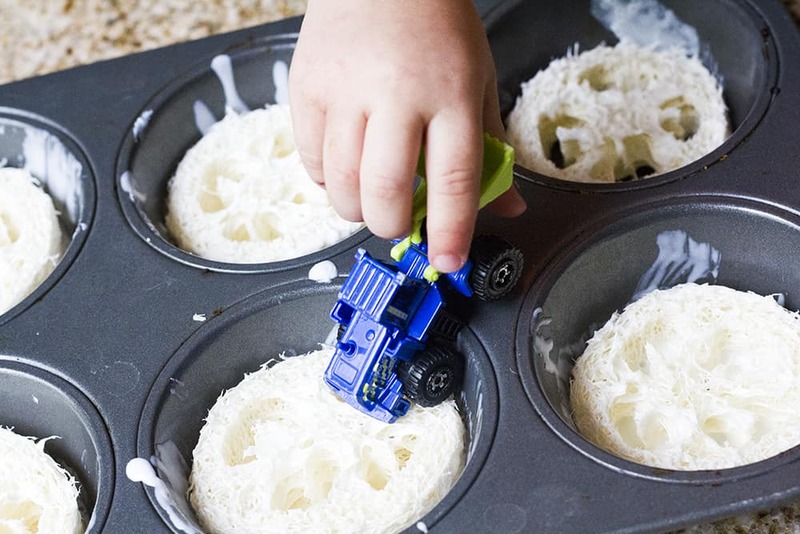 Remove and place in large muffin tins. 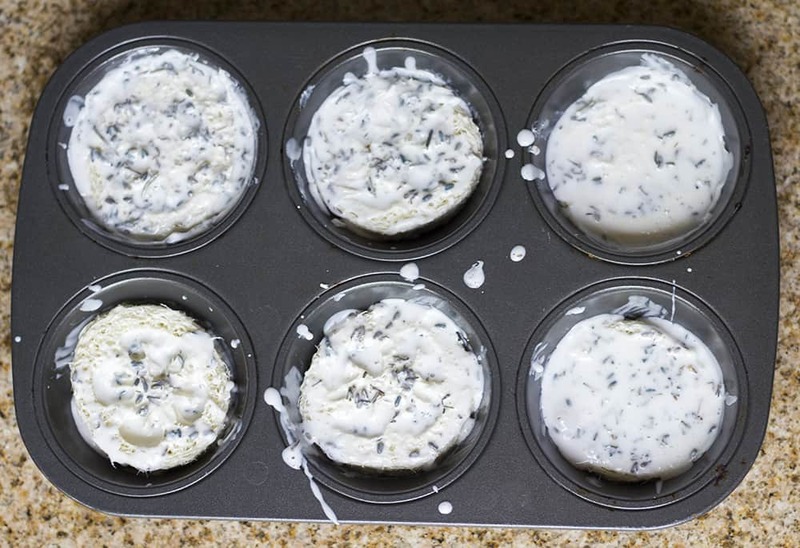 Stir lavender buds into remaining soap mix, and pour over loofahs in muffin tin. Let sit 4 hours, then remove. I used to make homemade soap with my children when they were younger. We made it as party favors, teacher gifts and just for fun. 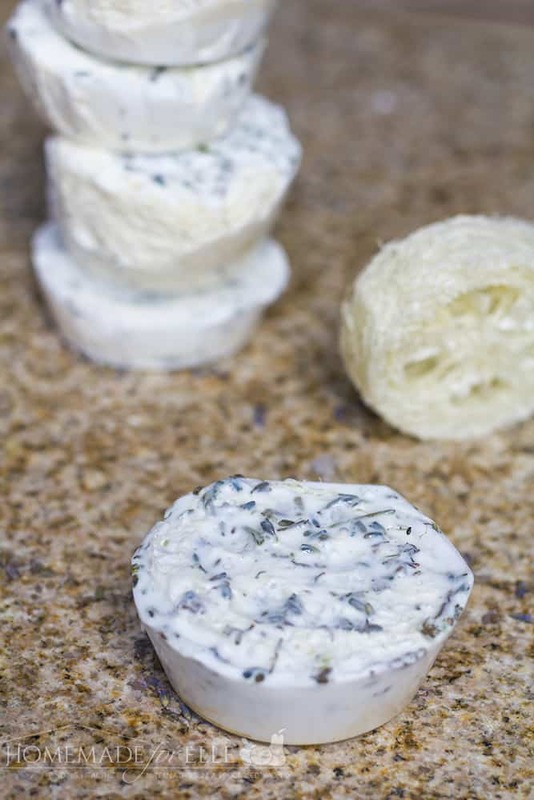 We made loofah soap, too, but used a different technique. I feel a blog post coming on. 🙂 Thanks for the inspiration.